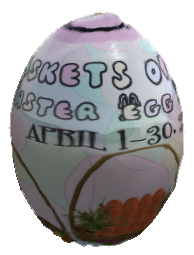 From now through April 30, stop by Foxdale Fine Foods and see if you can find the 3 eggs hidden around the store. Each egg contains an Easter basket (well, 2–Azora and Spellfire): Candy (chocolate, jellybeans, and peeps), carrots, and cookies. They’re set for sale for L$0. All hiding places are between the ground the roof (i.e., not under the land or in the water). All Azora baskets require a key, of course.